From the first moment on, Fantastic turned a lot of necks with his impressive appearance, lacquer-black in great elevation. Equipped with three first-rate gaits and an outstanding interior, he also presented himself on his 30-day test, where he scored points for his brilliant ride ability. This enormous rideability and his unshakeable mind made it possible, after multiple injury-related breaks to have a strong start without ifs and buts. After victories and placements in basic tests, he was able to qualify for the German Bundeschampionat at the age of six. But that's not all, last year Fantastic managed to win the first S-level dressage at the young age of 7 years. Great motivation and a high degree of dedication characterize the daily training with Fantastic, he fulfills all tasks set him with ease and gives us thus daily much joy. 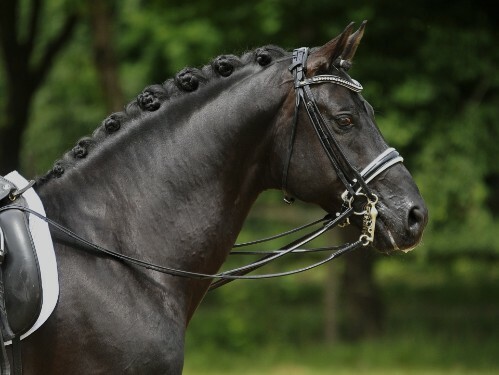 The very best dressage genes are combined in the showpiece pedigree of Fantastic: his father Fürst Romancier himself was the main premium winner, was rewarded highest marks in his stallion performance test (rideability 9.5, all basic gaits 9.0) and in 2009 was the most successful stallion of his year on the World Championship of 5-year old dressage horses. 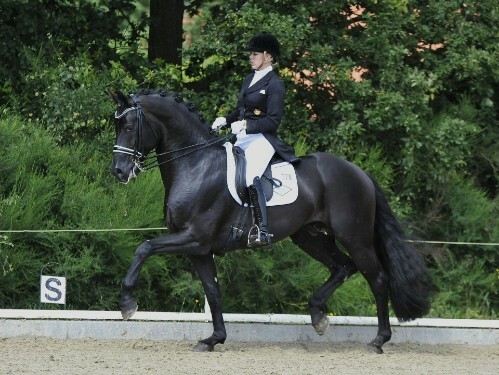 Fürst Romancier finished second in the final qualification at the Bundeschampionat with a grade of 9.0, before finishing fourth in the final, as well as at the World Dressage Championships. The dam's sire Sandro Hit, probably well-known to dressage horse breeder, he convinces on the one hand by his own sporting achievements (eg Bundeschampion and world champion of 6-year old dressage horses), on the other by his highly esteemed, unique sire performance (numerous federal champion, dressage world champion, several Licensing winner and descendants with World Cup successes or victorious in Grand Prix).